IOGEAR Rackmount KVM switches are designed to meet the needs of moderate to larger sized business installations, streamlining PC and server management while accommodating for upgrade and expansion. 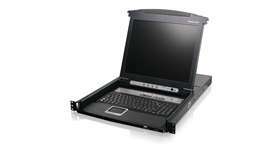 IOGEAR Rackmount KVM products meet the 19” rack mount standard, are ideal for server rooms, data centers, ISPs and test labs. 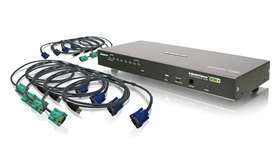 Designed for maximum reliability under the most demanding situations, IOGEAR Rackmount KVM switches are PS/2 and USB compatible and allow control of up to 16 servers directly, and expand to 256 via cascading. 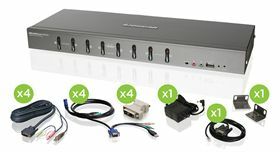 IOGEAR's 8-port USB DVI VGA KVMP Switch allows access and control of up to 8 computers from a single USB keyboard, USB mouse, and either a DVI or VGA monitor console. Experience video resolution up to 1920 x 1600 with the freedom of choosing either DVI or VGA interface. 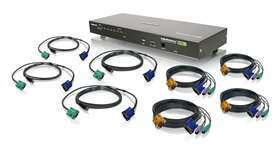 Straight out-of-the-box solution as this 8-Port DVI VGA switch comes with a set of DVI-D USB KVM cables! 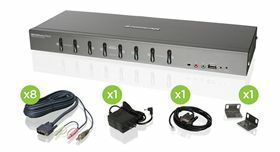 IOGEAR's 8-port USB DVI VGA KVMP Switch allows access and control of up to 8 computers from a single USB keyboard, USB mouse, and either a DVI or VGA monitor console. Experience video resolution up to 1920 x 1600 with the freedom of choosing either DVI or VGA interface with a complete mix set of both VGA and DVI KVM Cables. 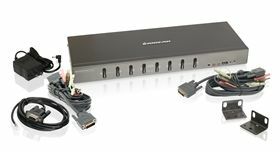 IOGEAR's 8-port USB DVI VGA KVMP Switch allows access and control of up to 8 computers from a single USB keyboard, USB mouse, and either a DVI or VGA monitor console. Experience superior Dual-Link video resolution up to 2560x1600 with the freedom of choosing either DVI or VGA interface. 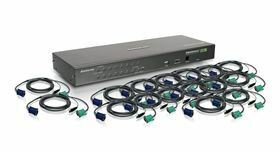 This 8-Port VGA DVI KVM switch is a true out-of-the-box solution as it comes with a set of USB KVM cables. 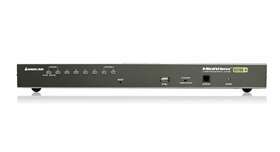 IOGEAR's 8-port USB DVI VGA KVMP Switch allows access and control of up to 8 computers from a single USB keyboard, USB mouse, and either a DVI or VGA monitor console. Experience superior Dual-Link video resolution up to 2560x1600 with the freedom of choosing either DVI or VGA interface. 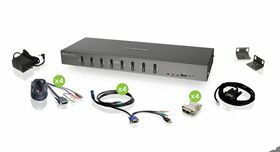 This 8-Port VGA DVI KVM switch is a true out-of-the-box solution as it comes with a mix set of VGA and DVI USB KVM cables! 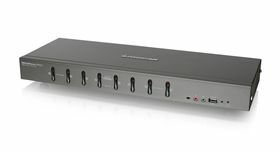 IOGEAR's 8-port USB DVI VGA KVMP Switch allows access and control of up to 8 computers from a single USB keyboard, USB mouse, and either a DVI or VGA monitor console. Experience superior Dual-Link video resolution up to 2560x1600 with the freedom of choosing either DVI or VGA interface. 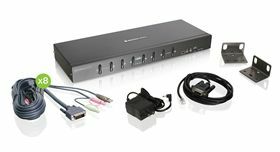 IOGEAR's 8-port USB DVI VGA KVMP Switch allows access and control of up to 8 computers from a single USB keyboard, USB mouse, and either a DVI or VGA monitor console. Experience video resolution up to 1920 x 1600 with the freedom of choosing either DVI or VGA interface. IOGEAR's GCS1808 KVMP is a combo USB and PS/2 switch allowing access and control of up to 128* computers from a single console (keyboard, mouse, and monitor). Cascade as many as 8 additional switches to bring the total number of connected computers to 64 computers that can be controlled from a single keyboard-monitor-mouse console. A custom ASIC (patent pending) provides an auto-sensing function that recognizes the position of each station on the installation, eliminating the need to manually set the position with DIP switches. Additionally, the GCS1808 features high density SPHD 15-pin instead of the usual 25-pin connectors thus allowing for a compact design and installation in a 1U system rack. The GCS1716 KVMP is a combo switch allowing access and control of up to 256 computers from a single console (keyboard, mouse, and monitor). As many as 16 additional switches can be cascaded bringing the total number of connected computers to 256 computers that can be controlled from a single keyboard-monitor-mouse console. A custom ASIC (patent pending) provides an auto-sensing function that recognizes the position of each station on the installation, eliminating the need to manually set the position with DIP switches. Additionally, the GCS1716 features high density SPHD 15-pin instead of the usual 25-pin connectors thus allowing for a compact design and installation in a 1U system rack. 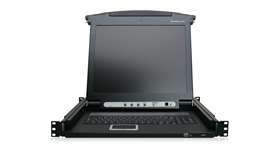 IOGEAR's 8-Port 17" LCD Combo KVM Switch integrates a 17" LCD console with an 8-port KVM (keyboard, video, and mouse) switch, offering secure access to 8 VGA, USB or PS/2 computers. This 8-Port LCD KVM features a convenient rack mountable sliding / retractable 17" TFT LCD active matrix monitor and keyboard with built-in touchpad for a space-saving and streamlined integration. For added convenience it also supports an external USB mouse. All this in a universal 1U rack mount space. IOGEAR's GCL1816 is an integrated LCD console with 16 port KVM (keyboard, video, and mouse) switch that offers secure access to 16 VGA, USB or PS/2 computers. It features a convenient rack mountable sliding / retractable 17" TFT LCD active matrix monitor and keyboard with built-in touchpad for a space-saving and streamlined integration. For added convenience it also supports an external USB mouse. An extra USB / PS/2 console port is provided on the rear panel to manage the LCD KVM switch from an external console (monitor, keyboard, and mouse). All this in a universal 1U rack mount space. 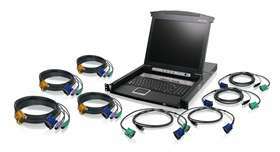 The GCS1716KITU KVM is a combo switch with USB KVM cables included; allowing access and control of up to 16 directly connected computers from a single console (keyboard, mouse, and monitor). As many as 16 additional switches can be cascaded bringing the total number of connected computers to 256 computers that can be controlled from a single keyboard-monitor-mouse console. A custom ASIC (patent pending) provides an auto-sensing function that recognizes the position of each station on the installation, eliminating the need to manually set the position with DIP switches. Additionally, the GCS1716 features high density SPHD 15-pin instead of the usual 25-pin connectors thus allowing for a compact design and installation in a 1U system rack. 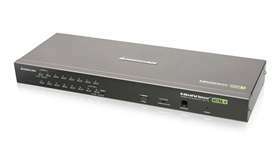 The GCS1716 KVM is a combo switch allowing access and control of up to 256 computers from a single console (keyboard, mouse, and monitor). As many as 16 additional switches can be cascaded bringing the total number of connected computers to 256 computers that can be controlled from a single keyboard-monitor-mouse console. A custom ASIC (patent pending) provides an auto-sensing function that recognizes the position of each station on the installation, eliminating the need to manually set the position with DIP switches. Additionally, the GCS1716 features high density SPHD 15-pin instead of the usual 25-pin connectors thus allowing for a compact design and installation in a 1U system rack. IOGEAR's GCS1808KITU KVMP is a combo USB and PS/2 switch allowing access and control of up to 128* computers from a single console with complete set of USB KVM Cable to ease with installation process. Cascade as many as 8 additional switches to bring the total number of connected computers to 64 computers that can be controlled from a single keyboard-monitor-mouse console. A custom ASIC (patent pending) provides an auto-sensing function that recognizes the position of each station on the installation, eliminating the need to manually set the position with DIP switches. Additionally, the GCS1808KITU features high density SPHD 15-pin instead of the usual 25-pin connectors thus allowing for a compact design and installation in a 1U system rack. 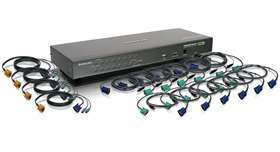 The GCS1808KIT KVM is a combo VGA switch that includes 8 KVM cables - Set of 4 USB and 4 PS/2 KVM cables. IOGEAR's 17" LCD KVM Combo Console offers a space-saving, streamlined approach to IT environments by integrating a keyboard, 17" TFT LCD active matrix monitor, and touchpad in one unit. Take advantage of flexibility between using USB keyboard/mouse and PS/2 keyboard/mouse. 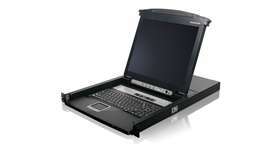 IOGEAR's GCL1808KITU is an integrated LCD console and 8 port KVM (keyboard, video, and mouse) switch with bundled USB KVM cables that offers secure access to 8 VGA, USB computers. It features a convenient rack mountable sliding / retractable 17" TFT LCD active matrix monitor and keyboard with built-in touchpad for a space-saving and streamlined integration. For added convenience it also supports an external USB mouse. An extra USB / PS/2 console port is provided on the rear panel to manage the LCD KVM switch from an external console (monitor, keyboard, and mouse). All this in a universal 1U rack mount space. 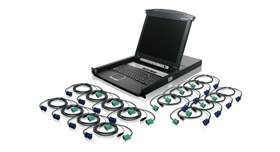 IOGEARz's GCL1808KIT is an integrated LCD console and 8 port KVM (keyboard, video, and mouse) switch with bundled KVM cables that offers secure access to 8 VGA, USB or PS/2 computers. It features a convenient rack mountable sliding / retractable 17" TFT LCD active matrix monitor and keyboard with built-in touchpad for a space-saving and streamlined integration. For added convenience it also supports an external USB mouse. An extra USB / PS/2 console port is provided on the rear panel to manage the LCD KVM switch from an external console (monitor, keyboard, and mouse). All this in a universal 1U rack mount space. IOGEAR's GCL1816KITU is an integrated LCD console and 16 port KVM (keyboard, video, and mouse) switch with bundled USB KVM cables that offers secure access to 16 VGA, USB computers. It features a convenient rack mountable sliding / retractable 17" TFT LCD active matrix monitor and keyboard with built-in touchpad for a space-saving and streamlined integration. For added convenience it also supports an external USB mouse. An extra USB / PS/2 console port is provided on the rear panel to manage the LCD KVM switch from an external console (monitor, keyboard, and mouse). All this in a universal 1U rack mount space. 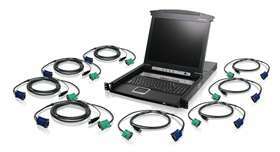 Need some help selecting the right KVM for you?